Mental health is important to us all and can be defined as a state of well-being where an individual is able to achieve their potential whilst coping well with the stresses of life and making a contribution to their community (1). Some people who experience difficulties in these areas go on to develop mental illnesses, such as clinical depression and schizophrenia. Approaching half of the adult population are likely to experience a mental illness at some stage in their lives (2). Research shows that urban environments can negatively impact our mental health, with higher rates of mental illness in urban compared to rural areas (3,4). This pattern has been observed across different countries from the UK to Japan (3). Given the consistency of these findings researchers have turned their attention to uncovering the factors that may explain the relationship between urban settings and mental health. Here we focus on the link between urban design and mental illness although much work has been conducted to identify person-specific factors that may sensitise people to the adverse effect of the city (5). Various methods have been used in research in this area, including postal surveys (6), walking studies (7) and field experiments (8). A common challenge with these methods is being able to recruit only small numbers of participants due to their expensive and time-consuming nature. Another issue is that usually only a restricted number of environments are explored within a study, reducing the applicability of the findings to other environments. The development of new technologies provides opportunities to improve and build upon some of these methodological approaches; smartphone applications or apps are one such example (9). Research apps can take advantage of the technical features of current smartphones, for instance environmental information can be captured not just via GPS mapping but also through photographic images and videos taken by participants using high quality camera phones. 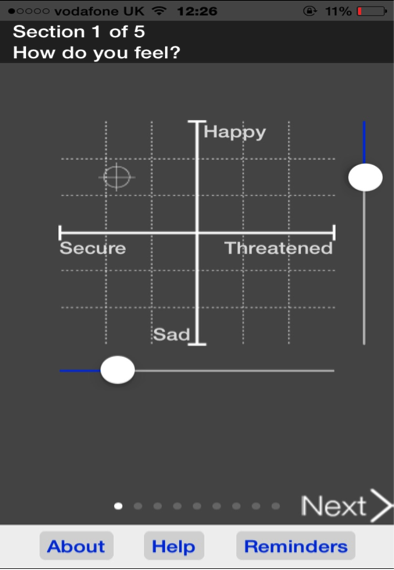 Participants’ responses to their environment can be recorded using traditional self-report items (see Figure 1) delivered using an app platform as well as more interesting visualization of emotions (see Figure 2). Innovatively physiological changes in response to one’s environment can be captured using popular wearable devices, such as the Microsoft Band (10) and Fitbit (11), which record multiple parameters including, heart rate and galvanic skin response (sweat). Data from these parameters can be used to infer changes in emotional state, such as stress. Outside of the opportunities for collecting useful data, apps can also be used to support research designs that are methodologically robust but challenging to administer, such as the Experience Sampling Method [ESM]. ESM is a structured diary technique that collects moment-to-moment information within the flow of daily life (12). Using ESM, participants are followed for a prolonged period (e.g. a week) during which they answer questions at multiple points throughout each day. ESM overcomes issues of recall biases (e.g. inaccurate information) and allows the measurement of changes throughout the day, ideal for urban design and mental health research. Traditional approaches require the purchase of specific equipment to administer ESM, which creates a number of challenges including high rates of missing data due to equipment malfunction and participants forgetting to carry the kit throughout the day. Additionally the traditional approaches can be quite costly, given the need for purchasing, maintaining and replacing the equipment and expensive incentives to encourage the return of the equipment. Apps not only address these issues, by conveniently being installed and completed through participants’ smartphones (no extra equipment required) but can also provide extra information such as GPS co-ordinates, which allow for novel and additional analyses to be conducted. The LondonMood project utilises an app to explore specific features of the urban environment that are related to mood and well-being (13). The LondonMood app sends participants several alerts a day for a period of one week. 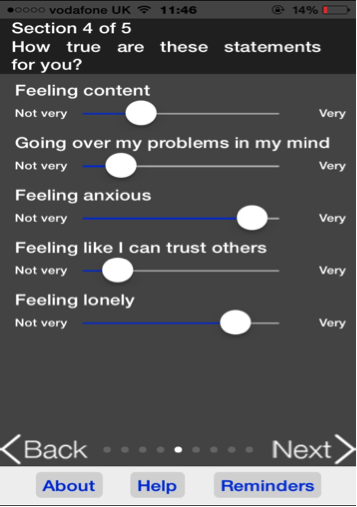 At each alert the location of the participant is recorded (using GPS co-ordinates) and they are simultaneously asked to report on their mood using 14 questions. Using the app, participants are then asked to take a photograph of a scene from their surroundings that is salient to them, and to record what they notice about their environment in an open text box. LondonMood participants generally travelled around the Greater London area. During piloting the app was able to accurately record locations in other cities as participants travelled, including Toronto (Canada), New York (USA) and Florence (Italy), meaning potentially a similar app could be used in other global places outside of the UK. The variety and wealth of data collected for LondonMood offers a number of possibilities for analysis. For instance, the photographs can be examined and coded for common environmental characteristics (potentially including urban design features) which can be linked to the mood information to establish whether there is a relationship between the two. Furthermore, Geographical Information System techniques can be applied to the LondonMood data to code the geographical locations with annotations of the well-being and mood responses. Using this information a multi-layered map can be built using heat-map codings for emotional valence with other relevant information (eg. traffic) layered on top to visualize characteristics of interest. Using apps for research is not without its drawbacks. For instance the development of the app can be quite costly, plus researchers also need to budget for the technical rectification of initial problems with the app once it is launched. Although the initial costs may appear quite high for an app study, it can be more cost-effective than alternative approaches as it avoids the expense of equipment purchase, maintenance and replacement. Another issue with app studies is that individuals without smartphones are unable to participate. Although the results of a recent survey showed that the majority of people in the UK (66%) have a smartphone (14), this restriction does bias the sample. The problem can be addressed with the provision of devices to participants which support the app but this would be an additional cost to the projects, making them less affordable. Moreover, apps can produce a high volume of data, especially if they are using ESM and/or wearable devices. Therefore much time and expertise should be invested from the outset of the study to structure the data output to ensure its useability for data analysis. Research shows a link between mental health and urban environments, with much effort now focused on uncovering the factors that explain this relationship. Studies examining the impact of urban design on mental health have adopted various approaches. Smartphone applications offer new opportunities to refine our understanding of the mental health-urban design association through the collection of data from different media (eg. photographs, GPS co-ordinates) whilst participants are in the environment of interest in real time. Apps provide the ideal platform for facilitating the interdisciplinary efforts (biology, psychology and urban design) that are necessary in broadening our understanding in this area and advancing the field. The LondonMood project was supported by a grant from the Richard Benjamin Trust (ref: RBT 1304). 2. Kessler RC, Berglund P, Demler O, Jin R, Merikangas KR, Walters EE. Lifetime prevalence and age-of-onset distributions of DSM-IV disorders in the National Comorbidity Survey Replication. Arch Gen Psychiatry. 2005;62(6):593–602. 3. Peen J, Schoevers RA, Beekman AT, Dekker J. The current status of urban-rural differences in psychiatric disorders. Acta Psychiatrica Scandinavica. 2010. p. 84–93. 4. Vassos E, Pedersen CB, Murray RM, Collier DA, Lewis CM. Meta-analysis of the association of urbanicity with schizophrenia. Schizophr Bull. 2012;38(6):1118–23. 5. Heinz A, Deserno L, Reininghaus U. Urbanicity, social adversity and psychosis. World Psychiatry. 2013;12(3):187–97. 6. Guite HF, Clark C, Ackrill G. The impact of the physical and urban environment on mental well-being. Public Health. 2006;120(12):1117–26. 7. Ellett L, Freeman D, Garety PA. The psychological effect of an urban environment on individuals with persecutory delusions: The Camberwell walk study. Schizophr Res. 2008;99(1-3):77–84. 8. Evans GW. The built environment and mental health. J Urban Health. 2003;80(4):536–55. 9. Miller G. The Smartphone Psychology Manifesto. Perspect Psychol Sci. 2012;7(3):221–37. 12. Palmier-Claus JE, Myin-Germeys I, Barkus E, Bentley L, Udachina A, Delespaul PAEG, et al. Experience sampling research in individuals with mental illness: Reflections and guidance. Acta Psychiatr Scand. 2011;123(1):12–20.